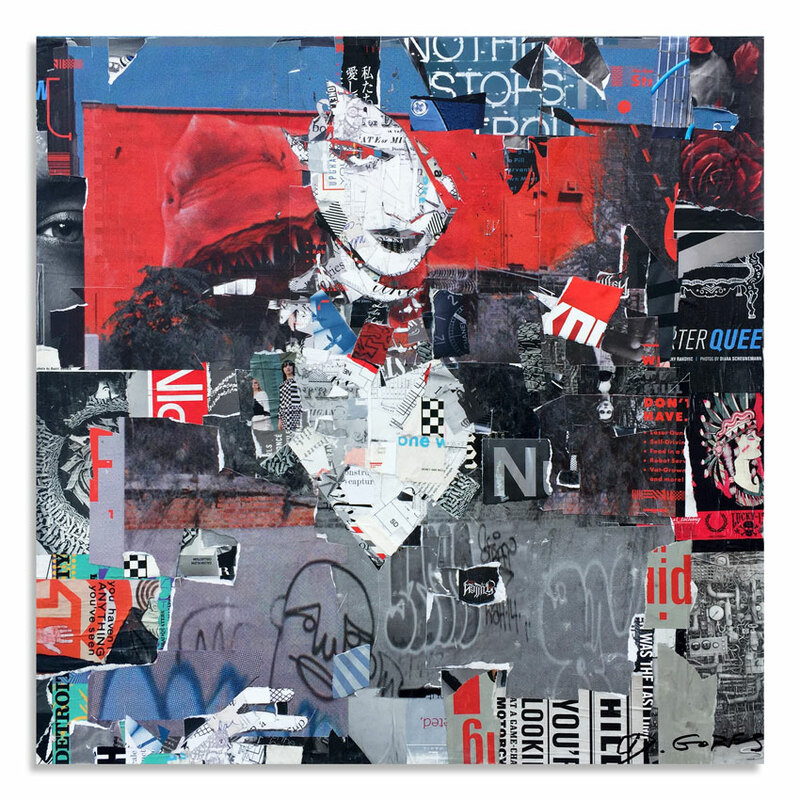 This RUN comes signed by Derek Gores and includes an Original Artwork Letter of Provenance from Inner State Gallery. In his collage portraits, Derek Gores recycles magazines, labels, data, and assorted found analog and digital materials to create the works on canvas. The series showcases Gores' contrasting interests in the living beauty of the figure, the angular and abstract design aesthetics of fashion, and a fearless sense of play. His fine art canvases are exhibited by galleries in New York, Los Angeles, Chicago, Sydney, Cologne, Miami, Santa Fe and more. Gores' design clients include Dwell Magazine, Lincoln Motor Co., ESPN, Lenny Kravitz, Lucasfilm, Kings of Leon, U2, Adidas, Madonna, Harley Davidson, Standard Collective, the National Football League, LiveNation, SEIU and more. The Rhode Island School of Design grad lives and works in Melbourne, Florida, exhibiting and curating with the bold upstarts there, surrounded by the intellect and culture of the Space Coast. Derek was honored to have his work selected for the Manifest Hope DC exhibit coinciding with the Presidential Inauguration in 2009, and in 2010 he was named "One of the 40 important artists of the New Contemporary Movement", while in an exhibition in London. "I like my pictures to barely come together with teasing little details. Sort of like how the mind can't help but wander, even when trying to focus on one thing. In the collages, some of the little bits I use are deliberate, but in most I'm trusting randomness to help build an end result more interesting than I could have planned. One friend calls it a 'Zen Narrative.' "
His subjects are simply figures and objects in a space, influenced by heroes Gustav Klimt, Egon Schiele, Franz Kline, Rube Goldberg, Max Ernst, and, "those great old long-exposure photos of Abraham Lincoln, where you can feel the whole minute inside each image. I love that buzzing stillness. I do reference a classic beauty, but made of raw and geometric and un-designed parts. My real subject in the figurative women is the study of 'Fierce'. Strength, honesty, vulnerability- admired with utmost respect. I'm not interested in heavy, conscious concepts- I make something simple and let the elements combine in the head, reacting with each history the viewer brings to the table. When it goes well, I hope to create a real experience, instead of just a picture of an experience. But that sounds a little too huge... really I'm always hoping for that feeling of having the senses of a kid, where everything is new."